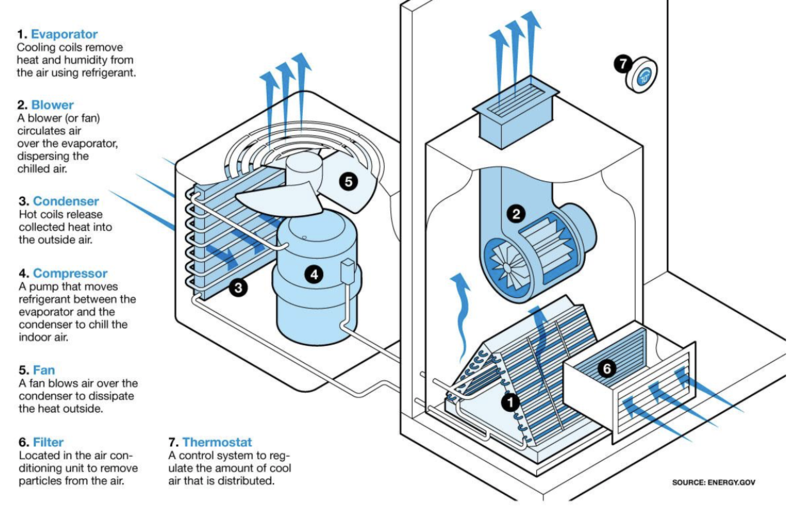 How Does Home Air Conditioning Work? Blog-Heating & Cooling-How Does Home Air Conditioning Work? First, some history. What we now know to be the modern air conditioning unit came about with one goal in mind: humidity control. In 1902, Willis Carrier drew up a method to remove the intrusive humidity from the air at a printing company in New York because the air’s moisture was affecting his operation, not just his comfort. Thus, the very first unit was designed for humidity control, not temperature, and cooling the air was a nice byproduct. By the 1930s, air conditioning became more common in public spaces such as department stores, theaters, and rail cars. It wasn’t until the 1960’s, however, to see air conditioners in the common residential home would be seen, and that was only ten percent of the population. Now, of course, it’s hard to imagine life without it. To provide cooling throughout the home, air conditioners transfer heat from a home’s interior to the outside. Is there only one type of home air conditioning system? 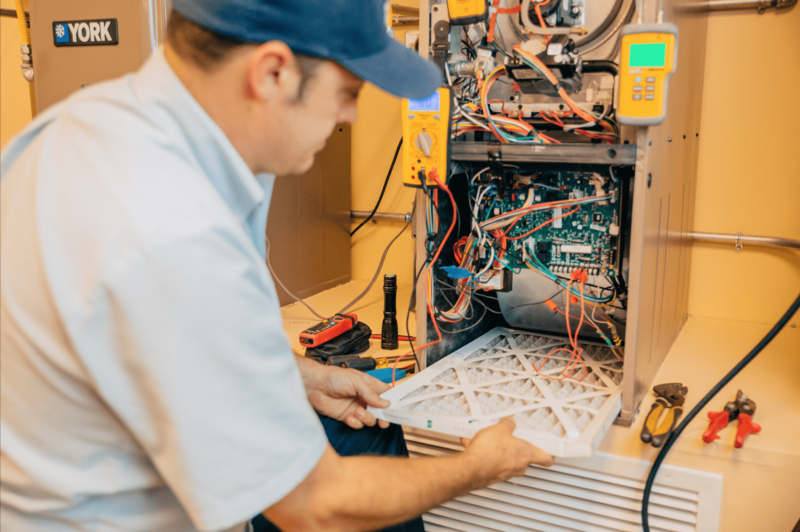 Actually, there are many options for installing air-conditioning systems into your home and many factors to consider when choosing the product that is right for you. Split System: What is it? Though we commonly refer to air conditioning as “central,” it’s actually most likely to be a Split System. Just as it sounds, a split system is divided into two main parts: an evaporator coil inside the home, which typically sits atop the furnace, and these units are attached by the lines/pipes to a condensing unit outside. When the temperature in your house begins to rise, warm air is drawn across the evaporator coil. The evaporator coil has a chemical inside, called a refrigerant (you will often hear people mistakenly refer to refrigerant as “Freon,” which is a brand, not the chemical) — this keeps the coil cold. The evaporator coil absorbs warmth from the air, which causes that humidity to condense and drain away. Thus, a central air conditioning system not only reduces the temperature in your house, it also lowers the humidity. When air conditioners pull humidity from the air, it funnels the resulting water, commonly referred to as condensate, into a drain. Though the amount can vary, people are often surprised by how much condensate a modern air conditioner will produce, which is between 5 and 20 gallons of water per day! 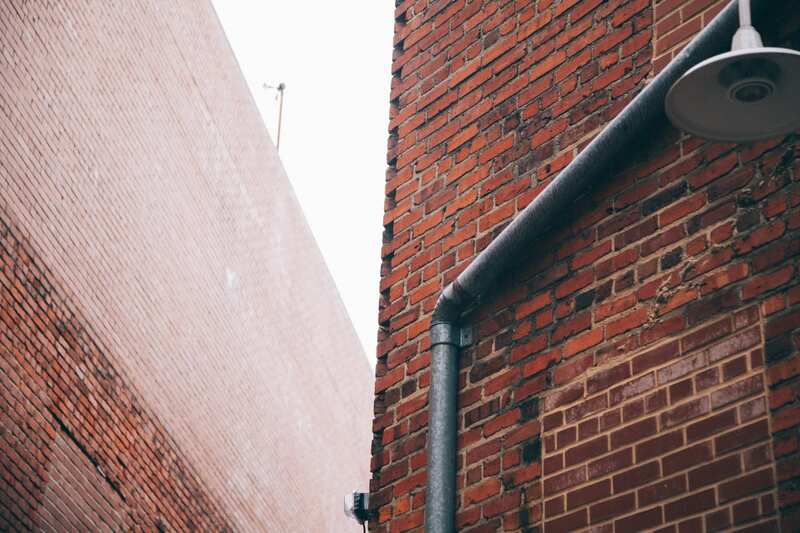 Central air conditioners are connected to the plumbing in your home, so there is always an exit for condensate. It’s only when these outlets are blocked that leaks occur inside the home. If this happens, call an HVAC professional as soon as possible to fix the issue and prevent further damage. 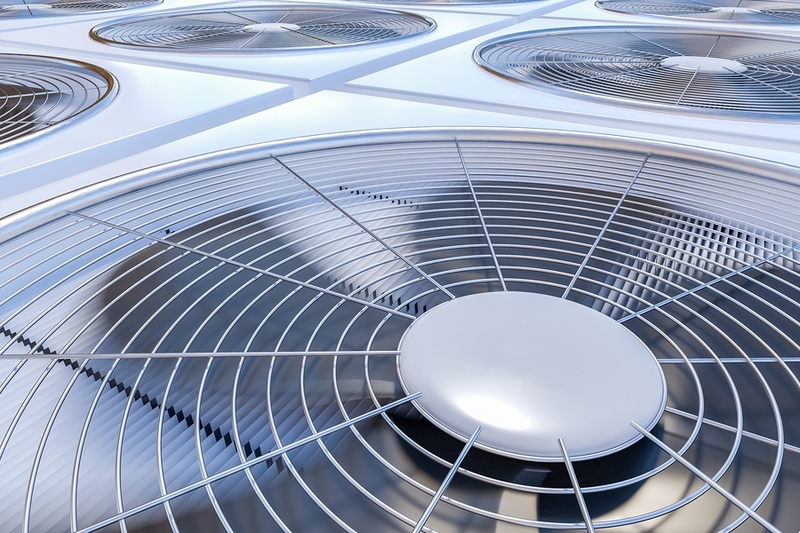 Refrigerant running through the lines contributes to the cooling aspect of an air conditioning system. If you currently have an air conditioning system in your residential home, this is probably what you have. A detached home usually has ductwork, either located in the attic or under a crawl space. 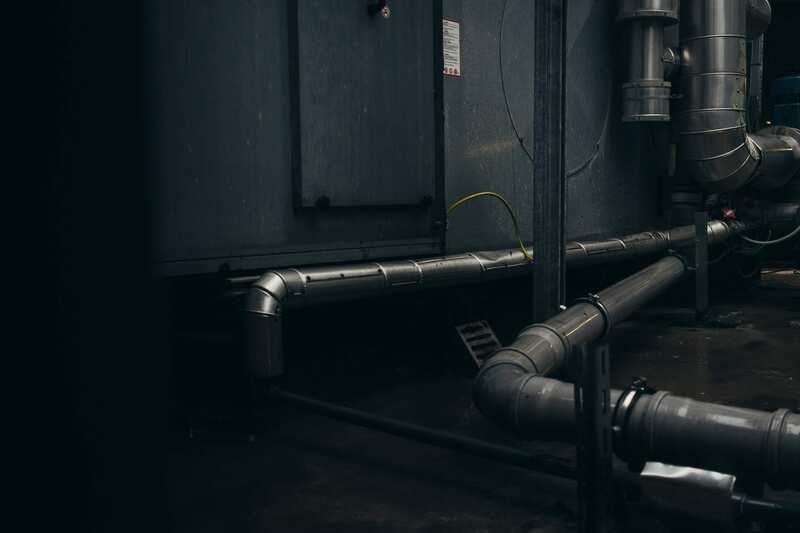 While the condenser and evaporator coil work to dehumidify and cool the home, the ducts help facilitate the forced air process of the split system — this moves the air internally to reach the registers that push air into individual rooms/spaces. It is important to note that the ductwork is what centralizes the system — it is a closed circuit that continues the same process in order to maintain a set temperature in your home. A central split system is most ideal for whole-house temperature control. Though it is possible to set up a zoning system to control certain areas, if you are looking to cool separate spaces, a ductless mini split is the way to go. Ductless Mini Split: What is it? There are a few reasons why a Ductless Split System may be the best choice for homeowners. First, if homeowners are looking to cool either a few rooms or even just one, this is likely the best option. Next, as the name suggests, small spaces that do not have ductwork are excellent homes to install a mini split air conditioning solution. They can even be added to an addition to the home when tearing into the walls to add ducting is not an option. Installing a ductless mini-split system is minimally invasive. You can even put one in your garage! It is important to note that although you can obtain a mini split to cool just one room, it is not like a window or portable air conditioner. It’s basically a direct alternative to a traditional split system, only that it doesn’t require ductwork to force air throughout the home. Here’s how it works: a ductless split system operates on a heat pump, which can both cool and heat, unlike your standard furnace/AC set-up where each unit does the heating and cooling, respectively. A heat pump transfers heat from one place to another. Now, why are we talking about heat when discussing air conditioning? It is important to note that there is no such thing as cooling the air, only removing heat from one place to dispense elsewhere. So, when it’s hot out and you are cooling your home, they use a refrigerant to transport heat out of your home, leaving your air cool and comfortable. Conversely, when it’s cold out instead of pumping the heat out of your home, the process is reversed and the heat pump transfers heat into your home from outside. These mini-split systems are surprisingly efficient at this process. Mentioning refrigerant should clue us in to the fact that installing a mini split is still something a professional should do. Again, it is a somewhat complex system, it just doesn’t need ducting to function. The outdoor unit is a condenser, often called a slim unit because it is significantly smaller than a traditional condenser and the indoor unit is an air handler mounted to the wall. If you want to cool the whole house, you simply install individual room air conditioners in each space you want cooled. It uses the air inside each room for the cooling and heating process — the coil is built into the air handler. For an energy efficient, quiet, ductless alternative, mini-split air conditioners are a wonderful thing to consider. Packaged Unit: What is it? A Packaged Unit is self-contained system that is often placed in a mobile or modular home when ductwork is under the home in a crawl space. They are also commonly seen in condominium and apartment complexes where there is a flat rooftop for them to rest upon. They are called packaged units because they contain both heating and cooling components in the same system. A packaged unit is different than a split system because there is no separate indoor and outdoor system — both elements are housed in a single cabinet. 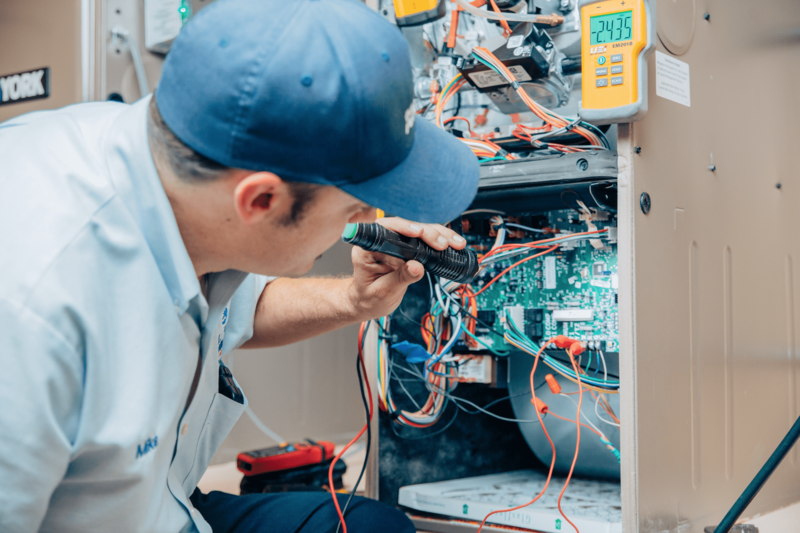 The air conditioning component of a packaged system is electric and the heating element can be gas, resulting in an electric/gas system or there can be a dually electrical system where a heat pump and air handler are used. Like a central split system, ductwork is a necessary component of this unit type. It is important to note that when shopping for a new air conditioner, homeowners should consider a few factors. For one thing, it is not wise to look up the supply cost of a new system in the box. A reputable HVAC contractor will quote parts and labor together. Labor is an important part of the bottom line and you want a company you can trust to do a proper installation. Because there are many elements to an installation, whether it’s a central split system or a ductless one, you will have two or more installers doing the job. Prices vary depending on what equipment you are installing, meaning the quality and size contribute to the cost. Also, do you need to replace your outdated furnace to be compatible with your new, energy-efficient air conditioning? Is your ductwork in really bad shape? Again, it depends on a variety of factors. Most companies will offer complimentary in-house assessments to quote a price for whatever your needs may be. Just remember to choose a company that employs technically knowledgeable, dependable staff to do the job. With everything you’ve learned about air conditioning, call your local HVAC company to see what best fits your needs! Bill Howe Heating & Air provides free in-home evaluations to tailor the right system for your family’s needs. Call 1-800 Bill Howe (245-5469) for a free quote today! This was very interesting and eye-opening! Thank you for posting this, very helpful information for educating the consumer!